The extension "sanitizes and blocks any CSS rules which may be designed to steal data". Note that you may run into issues on sites that use these rules for legitimate purposes. The developer plans to introduce support for a whitelist in future versions to address the issue. An option to toggle it on or off globally is provided already. CSS Exfil Protection adds an icon to the browser's main toolbar. The icon shows the number of blocked CSS rules to indicate that content was blocked on the page; this does not necessarily mean that the page was used in an attack as the CSS rules may be used for legitimate purposes as well. CSS Exfil Protection is open source. You can browse the code on the project's GitHub page. It should probably be mentioned that this is from the beginning of 2018 and not new as written here. 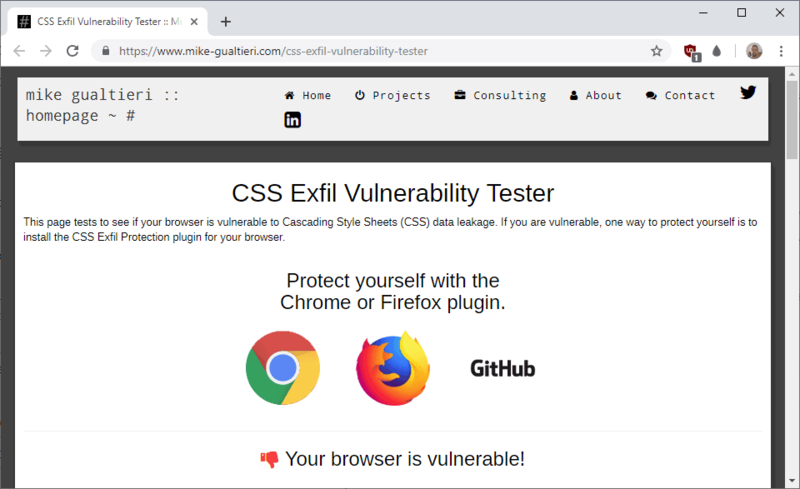 I’ve installed ‘CSS Exfil Protection’ extension for Firefox ever since it was launched on the basis of the vulnerability it addressed without ever understanding that very vulnerability. You said it, brother (not my typical wording but helpful to emphasize!). Romeo and Juliet, 21st century : Romeo as the Web user, Juliet as the new technologies : love leads to drama, sometimes. Darn. @Damien, now that’s interesting. Could you investigate and try to discover what extension and/or setting of yours protects your Firefox from this CSS Exfil vulnerability? @Tom Hawack: have you tested your vulnerability? I would not be surprised if it is uBO, which you use too. without the ‘CSS Exfil Protection’ extension for Firefox OR with but disable from about:addons OR unchecked from its toolbar button the test page shows ‘Your browser is vulnerable!”. I have several protection tweaks and extensions so if someone should be able to be protected from this CSS Exfil vulnerability it is obviously my Firefox as it is. 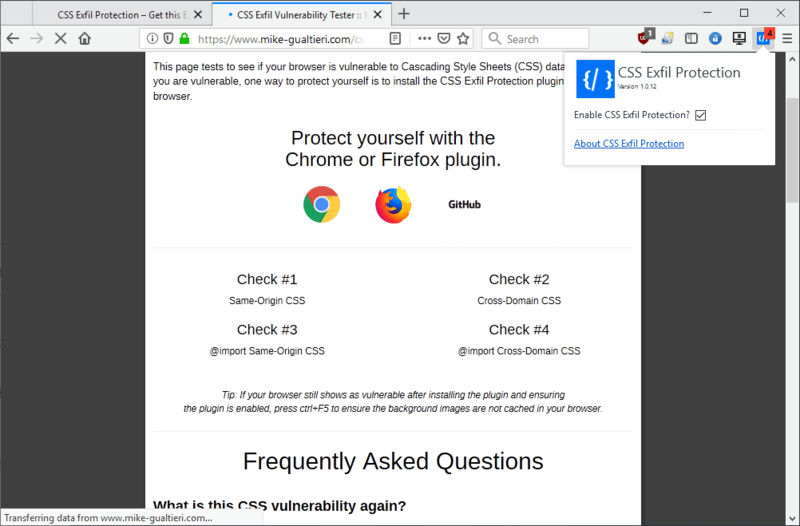 You and Damien do not use the dedicated ‘CSS Exfil Protection’ extension for Firefox and yet the test page indicates no vulnerability : that’s what puzzles me. @Damien: same here, don’t know which extension is responsible. @Damien: I’m on the same page as Tom Hawack on this. Very curious as to what’s blocking the CSS exploit (as it could be useful for zero-day stuff). I have a good number of extensions aimed at privacy/tracking protections, lots of about:config changes… FF still shows as vulnerable to this exploit unless I activate ‘CSS Exfil Protection’. I wonder if you have an extension already doing some kind of CSS override (look and feel stuff). @gazoo: I’m only using uBO on Firefox and my browser is reported as not vulnerable even after I turn it off during the test. I think it has nothing to do with certain extension but probably some “about:config” tweaks. My guess, it is probably because I enabled “privacy.firstparty.isolate”. I can’t think of anything else because I don’t remember I’ve ever done other tweaks but this. @Kalandrai: I have that one disabled (i.e. set at “false”) and still get “not vulnerable”. However, redoing the test using a brand-new browser profile with factory-default user prefs & no addons, the test page now shows the browser as vulnerable — ie. it successfully loaded the CSS injection test-script (presumably non-malicious in this case). As such, it seems that at least 1 of the modified user prefs in my “hardened” browser profile is preventing the test-page from correctly loading the self-hosted jQuery library, hence the false-negative wrt CSS injection test. * do you know what to add to uBO to block this CSS problem and avoid having to install yet another extension? Replying so that I get an alert when Damien finds out the add-on which fixes the vulnerability for his browser. That blocks the test, not the vulnerability. Vulnerability can only be fixed by Chromium devs, captain obvious. Hence the name “ubo fix” DUH!!!!!! Stop being severely idiotic. No-one is interested. There is zero point and it would give anyone doing it a false sense of security. Your filter, as is, would only work on the one site, the one which is designed as a test and is not actually malicious. Any testing using this site would result in a true negative (opposite of a false positive). Even if you did make the filter global, any real world attack could use any naming convention. That doesn’t fix anything, cause that rule will only change the test page value, it won’t protect you from the exploit whatsoever. No offense of course, but I though you should know. It is the perfect fix, not running the vulnereability in your browser is a sure fire way to prevent it before it happens, ofcourse the true fix is with the browser devs only, another ungrateful smartass. Thank you! That worked nicely. I prefer doing this stuff through uBlock Origin instead of adding more browser extensions. @Anonymous: No, I didn’t read any of the replies because I actually posted my comment before any of theirs were visible. But it seems it took several hours for my own comment to become visible, and so it now appears far down the thread. Facepalm yourself next time. As other commenters have stated, this is just a uBlock Origin rule to “break” the browser test on Mike Gualtieri’s page; this does NOT protect you from the exploit, it just prevents his page from working! Rofl nice, this is the equivalent of putting black tape over the “check engine” light. Killing the messenger fixes every situation, right? Martin, can you delete this post? **** like Jason are using this useless adblock filter that does nothing to stop the actual vulnerability. @Marcus: Did you just call me a foul name? Nice. What a big man you are. Okay…Can you clarify what Exactly you mean by this? See…Im thinking there is NEVER a legitimate purpose to sneak onto my computer & inspect/steal info. when theres always the option to ask me for it. Perhaps you meant that CSS has a legitimate purpose…? Or maybe this was just a throw away remark to cover all bases..? Is there a way you could get ads Without using the sinister octopus…? This method specifically uses a valid CSS selector that could and probably is commonly used across a wide range of websites, for example for CSS-only dropdown menus or any other style that directly involves input fields on a form. The fact that is commonly used and that it is hidden is what makes this dangerous. You can see from the technical docs that it specifically targets using these formula [attribute=value] and some variations using other selectors like ^~| etc. common to CSS. The only method I found to fully bypass this issue without installing the addon was to… err… disable CSS entirely with uMatrix (blocking the images only does nothing, since the vulnerability is loaded within the CSS). For cross-origin requests uBO was enough since the @import at the top of the CSS file creates a new HTTP request which is very easy to detect and block. So this was just an over looked unintended consequence then ? It most certainly looks like it is, after all this method is quite devious in sneaking on how a very popular technology works under the hood… I’d expect some move from the major browsers into adding an built-in protection for this, since it’s a fundamental vulnerability that affects all of them, but let’s see how it turns out to be. I think Ill stop using this handle as this mailbox is full now anyways. Or do i just like to lie about what i type on this website. Thats cool at least you admit youre a Fake..
That’s why i’m a feminist.. I know… I know… too many of you think youre smarter but youre not! Me Supergirl needs to prove that she is smarter than anyone here… please go on show us…. I so totally didnt write this. I think the GA opt-out is very likely to be worthless. I prefer to just block GA scripts, then I don’t have to wonder. I have to protect my online reputation here on this website. You’re the best at everything you do! Too bad all you do is disappoint. I think Ill stop using this handle as this mailbox is full now anyways. Or do i just like to lie to myself here on this website. Id like to apologize to ALL for what ever it is I did to set off this jealous nitwit in the first place. Also Thanks to those who have kept a sense of humor about it. I feel like royalty having my own personal ‘Foole”…. I have Always filled out the email addy…. Lets see if i can stop with my OWN lies about what i post here on this website. Seems like a huge problem. Why no action on this other than a 3rd party solution. I don’t get it. This 3rd party solution was developed by the same researcher who noticed and published this vulnerability, and from there the browser makers will implement it. Hopefully, at least, although seems likely since it’s a vulnerability not on the browser but on the underlying technology used by the web itself and affects everyone. Both are using the noscript addon. No CSS Exfil Protection for the chromium-based Opera available at this time. 1.If you block 3rd party CSS with uMatrix and enter passwords/credit card details only on popular sites. (Youtube,Amazon,Protonmail etc.) would you still be prone to this vulnerability? 2. Why Google developers are yet to address it? This is known for at least more than a year if my memory serves. 1. Yes, since the CSS loaded from the 1st party may be using this vulnerability. This is however very unlikely to happen in any of the major companies’ websites for two reasons. First of all this is code that runs in your machine and can be easily reviewed by anyone, and secondly, while this vulnerability exists, the owner of the site has to actively take steps to implement it. Can you imagine the shitstorm that would fall down on Amazon, Google, Youtube, etc if they were caught doing this? This would be WAY beyond the Facebook’s recent f*** ups, since there is literally no way to deny involvement by any oversight. 2. The browser extension has been developed by the very same researcher who published this. Up until now it was not really clear the implications this could have, so the browser developers may have just dismissed this. However since the vulnerability is at the very core of how the modern web works, I’d expect to see steps taken from these companies to address this. Wow, glad that I asked here. This is the answer I was looking for. Thank you for your valuable time. Much appreciated. – Page rendering is affected even if I deselect “Enable CSS Exfil Protection?” checkbox. Why? It mainly affects buttons and input text fields. This is on Firefox 66.0.1. – I could not found a website where I get a hit. Maybe, that is good in the sense that it won’t interfere.